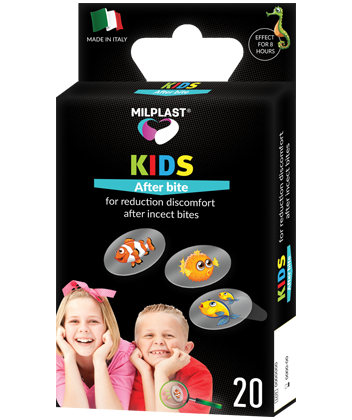 Milplast After bite children’s plasters are developed specially for children. These plasters contribute to relieving unpleasant sensations of itching caused by insect bites They create a mechanical barrier that prevents chafing and further irritation of the affected area. It can be easily removed and does not leave any marks on the skin! - Acrylate copolymer, soybean oil, grape seed oil, marigold extract, peppermint oil, lavender oil, linseed oil, flaxseed oil, tocopherol acetate, propylene glycol, linalool, limonene, mento. All materials used in the manufacture of patches are hypoallergenic. Natural ingredients such as calendula and zantoxylum have an effective soothing and refreshing effect on the affected area. 1. Clean the bite and the skin around it from dirt and moisture. 2. Using the applicator, remove the protective strict and firmly fix the patch on the inflamed area. For external use only! Do not leave on skin longer than 8 hours. Avoid getting the plaster in the respiratory system, mouth, eyes. Do not apply on open wounds. Use with caution to people who are prone to skin allergic reactions.